Since the text of the Constitution goes against the Hindu Right’s worldview, minister Ravi Shankar Prasad has to scavenge the manuscript to show us pictures to suggest its Hindu-ness. 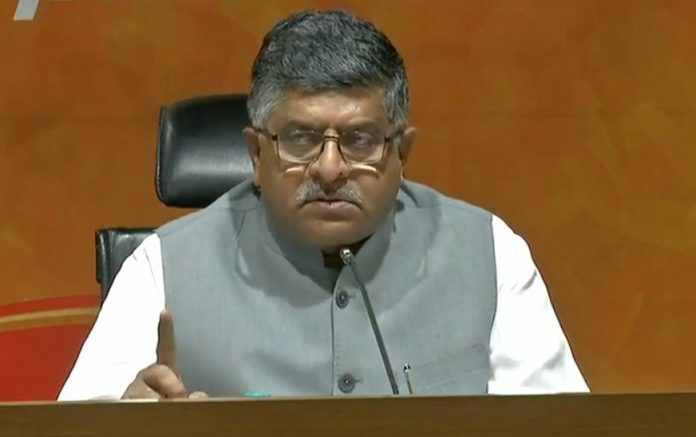 At a recent media event last week, union minister for law and justice and BJP veteran Ravi Shankar Prasad suggested to an audience that the Indian Constitution was a (mainly Hindu) religious document. He displayed a copy of the original manuscript of the Constitution and showed the chapters on fundamental rights and directive principles, pointing out the artwork above it: Images of Ram, Sita, Laxman and Krishna. Almost as an aside, Prasad named other pictures too: Kabir, Buddha, Mahavir, Akbar. Prasad is right: The framers indeed acknowledged India’s past. But apart from some symbolic gestures – the insertion of pictures in the original manuscript of the Constitution being one of them – they refused to be influenced by this past while drawing up the various articles of the Constitution. Also, the framers did not see the constitution-making process as a continuation of India’s ‘parampara’ (as Mr Prasad calls it). This new age that Nehru refers to was the transformation of India into a modern, constitutional republic. For Nehru, the constitution-making process, which would engineer this transformation, was part of a lineage that included the constitutional experiments of America and France, not some ancient Indian past. Speaking of the past, the Hindu Right has an embarrassing one— in the attendance sheet of India’s freedom and anti-colonial movement, organisations like the RSS are (deservedly) marked absent. Conscious of this fact, and determined to overcome it, the Hindu Right has attempted to appropriate leading historical figures like Ambedkar and Gandhi (who they once vehemently detested), and also historical moments like the framing of India’s Constitution ( which they also detested) and infuse them with a Hindu religious flavour whenever possible. Since the text of the Constitution goes against the Hindu Right’s worldview, it shouldn’t be a surprise that Prasad has to scavenge it and offer us pictures used in its original manuscript as evidence to suggest its Hindu-ness. The soul of the Constitution resides not in the images of its original manuscript but in its text; the articles of the Constitution are unequivocally based on modern, liberal ideas of democracy, secularism and rule of law, and not some religious/ancient political doctrine. No amount of childish brandishing of the copy of the original manuscript and pointing out images by Prasad is going to change this. At risk of invoking a cliché – one does not judge a book by its cover or the pictures unless, of course, the book in question is a book of pictures. Tragically, for the union law minister of our republic, the Constitution primarily seems to be just that – a book of pictures. And, he seems to have no qualms about peddling and getting hot and excited about this notion in public with aplomb. Vineeth Krishna E is lead associate editor for Constitutional and Civic Citizenship Project at the Centre for Law and Policy Research, Bengaluru. He primarily works on the CADIndia website — cadindia.clpr.org.in — a portal that facilitates public engagement with India’s rich constitutional and political history. It’s ironic that the ‘Hindu’ Gods who have been depicted are just that – Gods – and are the stuff of scriptures and epics. The ‘others’ (Buddha, Mahavir, Kabir, Akbar & Co) were real life people who left an indelible imprint on Indian history. In some manner, the inclusion of Hindu Gods amongst non-Hindu mortals (or vice-versa) may suggest many contradictions and concessions that hint at true secularism envisaged by the makers of the Constitution. Well the party in power today is so insecure about its existence and the Existence of it’s parivar, always trying to twist the narrative in their favour and to remind the people of this country of their existence, saying ho I we are there, we are there, so insecure that they want to use the Hindu word everywhere, so far as to say TAJ is a Hindu monument, Ganhiji did not admonish or reject us, so on and on, why feel so insecure, people have given you 5 years to rule, speak of your performance, or non performance, election is arround buddy. Anyways, on a more serious note, what RSP was trying to convey was the acceptance of our founding fathers of religious figures into our constitutional masterpiece as a symbol of India’s rich history and culture. Images represent stories and characters, which in turn represent values & societal norms which the constitution documents and aims to defend.